This post is about Wireless Router Basics. Home owners who have high speed cable or DSL systems installed at home can download email, browse web sites and even listen to music and videos once they have high speed access to the internet. Often they will connect their computers directly to the cable modem via the Ethernet connection. There is nothing wrong with this approach as long as there is only one computer to access this high speed connection. If you want to connect more than one computer then you need to purchase what is known as a router. It allows more than one connection from multiple devices. Think of a router as a device that will route and manage traffic such that traffic destined for one computer will always go to that computer and traffic destined for the other computer will always go to the other computer. It is a traffic cop such that one computer cannot hog all of the capacity. It also prevents unwanted visitors from getting through the router to your computer. Most small home routers can support connection of up to 4 hardwired computers, however this requires the use of connecting cables to run from the router to an Ethernet card on each computer. This is really a problem for a lot of families who want to have multiple computers spread throughout the home. Cables are unsightly and most homeowners do not want to have anything to do with them. Fortunately there are wireless routers that will support multiple computers up to a reasonable distance. 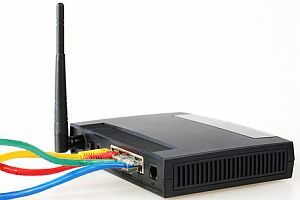 All you need to have is a wireless Ethernet card in your computer and you can connect with the router and hence the internet.There are the basics you need to know before getting a wireless router for your home network, as well as Network World’s tester’s top pick. Wireless routers have come a long way in a short time. The oldest standard wireless LAN technologies follow the IEEE 802.11a and 802.11b standards, which were established in 1999. The 802.11a standard uses the 5 GHz frequency and has a maximum data rate of 54Mbps. The 802.11b standard uses the 2.4 GHz band and delivers a data rate of 11Mbps. The upshot of this is make sure you purchase a router that supports 54Mbps of throughput for the data rate. Note that with all wireless routers, the actual speed you get over the airwaves varies greatly based on distance and other factors like the types of obstacles that lie between your computer and the wireless router that cause interference. The rates given here are really just theoretical maximums. New standards are being introduced which will see routers that support up to 150Mbps to 300Mbps. The 802.11n technology started showing up in many wireless routers in 2008, before the standard was even ratified. But the meat of the standard was there at the time, and manufacturers did not have to do much to update their wireless routers to comply with the standard once it was finalized. With a higher speed router there is less chance that your home network will become the choke point if one computer is generating a lot of data traffic. With the rapid deployment of broadband Internet access across the country and the world, the deployment of wireless routers shot up, too. This raised all sorts of security concerns, because wireless traffic is vulnerable to snooping. Use of WPA2 is recommended for wireless routers in the networks of both homes and businesses. Now a days most people protect their routers by applying a password to anyone who is trying to access the wireless signal. A few people will leave their routers open and anyone can use their service, leaving them open to paying for traffic that they are not personally aware of and exposed to downloading material that would be considered questionable. It also leaves them open to penetration of their computers as well. Always apply a password and only give it out to people who you want to use your high speed access. Today’s wireless routers are manufactured by companies including 3Com (which is being acquired by HP), Belkin, Buffalo Technology, D-Link, Linksys (owned by Cisco), Netgear, and others. They are sold in stores such as Best Buy, Staples and a host of other electronic stores around the country. Experts and any of these stores will be happy to walk you through the steps of setting up your router, although the instructions are pretty straightforward and simple to use. Once installed and with each of your computers equipped with a wireless Ethernet card, you will be able to enjoy the flexibility of using your computer in any room of the house or even the back yard.